10th November, St. Petersburg: Bill Hoffman of Team USA, foiled Australia's chance of an elusive double to emerge as Men's champion after Ann-Maree Putney took the women's crown of the 43rd QubicaAMF Bowling World Cup earlier at the Kontinent Bowling Centre. 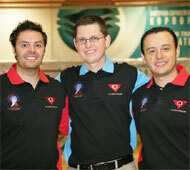 Bill Hoffman defeated top-seed, Jason Belmonte of Australia in the third and decisive game, 211-181 to become the first American male champion since Patrick Healey Jr stood atop the podium in Sao Paulo, Brazil in 1995. Both Hoffman and Belmonte had been fighting all the way through the 32 games during the qualifying rounds and fittingly were match against each other after the American ousted third-seed, Andres Gomez, 2-0 in the semifinals. The final went to the full distance, the only match to do so. After totally dominating the men's division all week, Aussie Jason Belmonte stumbled in the grand final, which allowed the American a sniff at the title. The infamous two-handed bowler rolled his worst game of the tournament in the opening match, 147 giving Hoffman an easy victory with 227. Belmonte then crusied to an second game victory over Hoffman, 269-191. But Hoffman caught a crucial mid-game hatrick to win 221-181 in the decider. "Somebody buy me a beer," said the slender 33-year-old American premier amateur who has won dozens of major international and domestic titles. He was instrumental when Team USA won the gold medal in the 2006 Men's World Championship in Busan, Korea. Meanwhile top-seed, Ann-Maree Putney of Australia won the women's crown defeating third-seed, Sun Hee Lee of Korea, 2-0 in the title match to become the fifth Aussie women to win the World Cup. Putney and her coach of 16 years, Geoff Bowness, both broke into tears after she defeated the Korean. "I told you she was going to win," crowed a triumphant Bowness as he tried to stem the tears. Putney rolled games of 280 and 247 to confirm the victory as her challenger, Sun Hee Lee shot 201 and 226 in defeat. The first runner-up defeated second-seed, Tina Hulsch of Germany 226,258 to 223,227 in the first match. The last and only time to date that any nation took home both titles in the same year was in 1986. The honors were engraved on the 1986 Cups for Sweden in the names of Peter Ljung, who just happens to be representing Sweden this year, and Annette Hagre. Story thanks to Mort Luby, photos courtesy of Hero Noda and QubicaAMF. 9th November, St. Petersburg: Both the Australian players, Jason Belmonte and Ann-Maree Putney head into the finals as top-seeds in the 43rd QubicaAMF Bowling World Cup after the end of the Top 8 quarterfinals on Friday. It went down to the wire in both divisions and with the single position round match to go. Andres Gomez of Colombia was just 10 pins ahead of Canadian Michael Schmidt, vying for third place and of course they were playing each other. Gomez hit 234 while Schmidt could only manage a 179, so the coveted last spot in the TV finals went to the South American. Over in the women's section, there was a similar situation though it was even closer. Sharon Koh of Malaysia, who was lying in second, Tina Hulsch of Germany in third and Sun Hee Lee of Korea in fourth, were all within 11 pins of each other, with Ann-Maree Putney out in front, but still only 38 clear of second placed Hulsch. Putney hit a 235 against Sharon to confirm her top spot, while Hulsch and Sun played out a 216 draw, thus getting 15 bonus pins each and sending Sharon down to fourth place and out of the finals. "We’re going to win it all. No question," said Australian coach Geoff Bowness after Belmonte and Putney won the top-seeded spots in the finals. No country has won both the men's and women's titles since 1986 when current Swedish competitor Peter Ljung took the title alongside Annette Hagre, but based on their performances so far, Belmonte and Putney could make Bowness’ dream come true. Bowness has been Puney's coach for 16 years and has seen her win dozens of major titles. But Belmote has never had a coach, except for his father who taught him how to bowl. The burly, curly-haired Aussie is one of the few competitors in St. Petersburg who doesn't have a mentor here. in the 39th game. 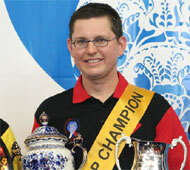 He wound up with a 40-game total of 9540, well ahead of America’s Bill Hoffman, who had 9352. Andres Gomez of Colombia took the third spot with 9008. The women's race was much closer. Putney posted a 40-game total of 8745. The other women's finalists was Germany's Tina Hulsch and Korea's Sun Hee Lee. "She's terribly disappointed," said Sidney Tung of the Malaysian Tenpin Bowling Congress, "but that's bowling." The top three scorers in both divisions advance to Saturday's televised finals. The third seeded bowler will bowled a best-of-three match with No. 2 to decide the opponent against the top seed in the title match. Photos courtesy of Hero Noda and QubicaAMF. 8th November, St. Petersburg: There is no stopping Australia's Jason Belmonte as the two-handed bowler led from start to finish in the Men's Top 24 round of the 43rd QubicaAMF Bowling World Cup and stretching his lead to 252 pins. Jason Belmonte, who led from Day 1 topping all the four blocks, returned to the Kontinent Bowling Centre and had a cracking start with 279 and 268 in his two opening games. The Aussie was continued to post consistently with lines of 243, 237, 258, 256, 269 and 228 to round off the 8-game block with 2038. Belmonte topped the round with a total of 7644 which included scores from his earlier qualifying round, 252 pins ahead of his nearest opponent. American, Bill Hoffman, who trailed Belmonte all the way, finished second with 7392 after having posted the second highest 8-game series of 1903. Colombia's Andres Gomez remained third with 7111 followed by Finland's Petteri Salonen improving two notches to fourth with 7094. 20-year-old Brazlian student, Marcelo Suartz remained in fifth with 7059. "I'll just be going out to bowl my best tomorrow and if that means that I win the game then fine," commented the Aussie. "I'd rather lose with a 220 than try to beat the other guy and land up with a 180." 2005 champion, Michael Schmidt of Canada, Paul Moor of England and Thomas Gross of Austria finished sixth to eighth positions to complete the top 8 into the next stage. Glenn-Morten Pedersen, who was fourth before this block, missed the cut in ninth. Belmonte is the only bowler from the Asian zone who will be matched with four from the American zone with the remaining three from the European zone. The men will move to the 8-game round-robin matchplay quarterfinals including a position round match, with 30 points for a win and 15 for a tie. Only the top 3 will proceed to the stepladder finals in which the third-placed bowler will meet the second-placed bowler over best of 3 games. The winner will meet the top-seed over the same format to determine this year's champion. 8th November, St. Petersburg: Qualifying round leader, Ghislaine van der Tol of the Netherlands led two Asians, Sharon Koh of Malaysia and Sun Hee Lee of Korea into the next stage of the 43rd QubicaAMF World Cup at the Kontinent Bowling Centre. As the top 24 took to the lanes for their next 8 games, Sharon Koh of Malaysia opened account with a 249 to take over the lead from overnight leader, Ghisliane van der Tol of the Netherlands with 24 pins. But the Dutches regained the lead by 7 pins after the second game only to find herself loosing the lead to the Malaysian after a lowly 171 in her third game as Sharon posted 226. Sharon put in consistent scores to remain in the lead until the eighth and final game when Sharon only managed to knock down 192. Ghislaine ended the block 13 pins ahead posting an 8-game score of 1692 and for a grand total of 6871. Sharon settled for second with 6858 while Korea's Sun Hee Lee moved up to third with 6842. A strong 1773 posted by Australia's Ann-Marie Putney also move her up eighth to fourth on 6801. Germany's Tina Hulsch posted the highest 8-game series of 1783 to leapfrog from 12th to fifth on 6770 while Aumi Guerra of Dominican Republic, Piritta Kantola of Finland and Helen Johnsson of Sweden made the cut for tomorrow's quarterfinals. Big names missing the cut were 2005 champion, Lynda Barnes of USA finishing in 12th, 51 pisn adrift the eighth-place score of 6735. Sue Abela of Colombia also failed to make through in 13th, 103 pins from the cut off score. Four from the European zone, three from Asian zone and one from the American zone will proceed to the 8-game round-robin matchplay quarterfinals including a position round match, with 30 points for a win and 15 for a tie so there is still all to play for. Only the top 3 will proceed to the stepladder finals in which the third-placed bowler will meet the second-placed bowler over best of 3 games. The winner will meet the top-seed over the same format to determine the champion. Photos by Sidney Tung, MTBC and courtesy of Hero Noda and QubicaAMF. 7th November, St. Petersburg: Jason Belmonte of Australia confirmed his supremacy on the lanes as he ended the Men's 24-game qualifying round of the 43rd QubicaAMF Bowling Cup in top spot with another scintillating performance on Wednesday evening. Belmonte, winner of this year's High Roller and the World Tenpin Masters, posted 1400 to widen his margin from 87 pins after three blocks to 117 pins on a total of 5606 from Bill Hoffman of the United States remaining in second. The Aussie knocked down lines of 228, 257, 235, 223, 223 and 234 to confirm his top spot. Hoffman, who dropped to fourth overnight, reclaimed second with 5489 ahead of Colombia's Andres Gomez picking up third spot with 5461. Norway's Glenn-Morten Pederson dropped to fourth from second with 5393 while the 20-year-old Brazlian student, Marcel Suartz rounded up the top 5 with 5371. Finn, Petteri Salonen took sixth position with 5315 followed by 2005 champion, Michael Schmidt of anada seventh on 5281. Apart from Belmonte, four other Asians in the top 24 were Remy Ong of Singapore in ninth, Mohammad Khalifa Al-Qubaisi of UAE in 12th, Daniel Lim of Malaysia up from 33rd to 17th and Ryan Lalisang of Indonesia in 19th. Squeezing into the 24th and final spot was Palo Lopes of Portugal on a total of 4999 and an average of 208.29. The top 24 field will be presented by seven from the American zone, five from the Asian Zone and the other half of the field from the European zone. The top 24 will bowl another 8 games tomorrow with scores from the qualifying round carried forward during which the field will be cut to top 8 for the quarterfinals on Friday, November 9. 7th November, St. Petersburg: Ghislaine van der Tol of the Netherlands, took pole position of the Women's qualifying round in the 43rd QubicaAMF Bowling World Cup after the fourth block to lead the top 24 into the next stage. Although the Dutch missed the highest 6-game series of the tournament by just 1 pin on 1402 against Aumi Guerra's 1403, Ghislaine van der Tol of the Netherlands must be pleased to be able to top the field of 74 women into the Top 24. The Dutch amassed a 24-game total of 5179, just 11 pins ahead of her nearest opponent. World Cup debutant, Sharon Koh of Malaysia, posted 1324 to give herself of total of 5168, again improving from fifth overnight to second overall. Helen Johnsson of Sweden improved from sixth to third with 5140 from early leader, Sun Hee Lee of Korea in fourth on 5129. Overnight leader, Sue Abela of Malta, could not repeat the form she showed in the previous block dropping to fifth with 5094 ahead of Aumi Guerra of Dominican Republic sixth on 5074. Piritta Kantola of Finland and Ann-Marie Putney of Australia took seventh and eighth positions with 5074 and 5030 respectively. 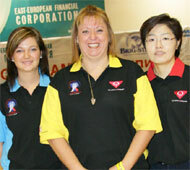 Hong Kong's Melody Yeung and 2005 champion, Lynda Barnes of USA completed the top 10 with totals of 5012 and 5010. The 24th placing went to Israel's Nofar Herskovitch with 4756 on an average of 198.17. 2004 Asian Ranked No. 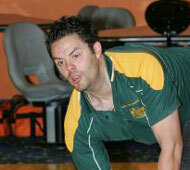 1, Putty Armein was unlucky to miss the cut by just 5 pins to finish in 25th due to a poor 179 final game. The top 24 will bowl another 8 games tomorrow where the field will be cut to top 8 for the quarterfinals on Friday, November 9. 8th November, St. Petersburg: A feast of high scores came in the Men's third block qualifying squads of the 43rd QubicaAMF Bowling World Cup as overnight leader, Jason Belmonte of Australia stretched his lead. In the first squad, 20-year-old student Marcelo Suartz from Brazil hit 1518 over his 6-game series, including a 279 game to top the block. "I had a really good day," he said. "I felt confident and I was able to visualise every shot and then execute it all well. I came here hoping to do well and so far I have to be pleased." In the second squad, several 270+ games and the list is long: Jason Belmonte had a 289, Remy Ong from Singapore had a 287, Glenn-Morten Pederson of Norway had back-to-back 279s, Colombia's Andres Gomez, Paolo Valdez of the Philippines, Germany's Achim Grabowski all had 279 and home favourite Alexey Parshukov had a 278. But they were all capped by our second perfect game from Argyrios Ketsetzis of Greece. He was naturally delighted and promptly turned round to the score display to take a photo of the proof of his achievement. 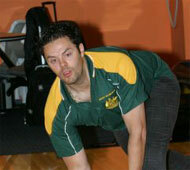 Jason Belmonte remained firmly in the lead on 4206 after 18 games, a 233 average. Glenn-Morten Pedersen moved up to second on 4119 and Andres Colombia took third spot with 4113. With just six games to go, the cut for the top 24 is a 208 average, with Vitas Gykis of Lithuania just in the list. 6th November, St. Petersburg: Sue Abela of Malta took over the lead of the women's division at the 43rd QubicaAMF Bowling World Cup after the third block of the four block qualifying rounds at the Kontinent Bowling Centre. Abela, who has featured in the World Cup for an amazing 9 years, recorded lines of 213, 225, 213, 248, 215 and 217 to surge into the lead after three quarters of the 24-game qualifying round with 3923 total. First and second block leader, Sun Hee Lee of Korea, settled for second with 3864. Dominican Republic's Aumi Guerra, who posted the highest 6-games series in this block with 1403, made the biggest jump from 17th to third with 3854. Tina Hulsch of Germany remained in fourth with 3848. Malaysia's Sharon Koh, who moved from 31st to 10th after the second block, continued to make headway improving by another 5 spots to fifth after another superb 6-game series of 1328 for a total of 3844. Swede Helen Johnsson dropped one spot to sixth with 3823 while another Asian, Melody Yeung of Hong Kong improved from ninth overnight to seventh on a total of 3805. 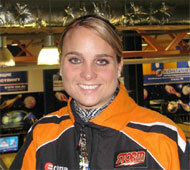 2005 World Cup champion, Lynda Barnes also dropped one rung to eighth with 3779. Ghislaine van der Tol of the Netherlands and Rebeca Veloz of Mexico rounded up the top 10 with 3777 and 3769 respectively. The cut for the top 24 will take place after 24 games have been bowled by all the competitors. At present the cut is a 197.1 average for the women. 5th November, St. Petersburg: Sun Hee Lee of Korea remained in the lead on a total of 2636 at the halfway stage of the 24 qualifying games in the 43rd QubicaAMF Bowling World Cup but the field has closed in onto the overnight leader. A superb 6-game series of 1367 from 20-year-old student, Sharon Koh of Malaysia has moved herself up into tenth place from 31st in the first block. Sharon, who is making her first Bowling World Cup appearance, plenty of experience of international play having been a national youth team member for two years. She won gold medals at both the Asian Games last year in Doha and a gold in the World Youth championships. The Malaysian also recently won the Women's Open Masters title at the Chinese Taipei Open. Malta's Sue Abela finished second with 2592 from a 1250 series in this block, while Sasha Luciano of Puerto Rico, making another Bowling World Cup debutante, shot 1323 to move up into third position on a total of 2568. Tina Hulsch of Germany took up fourth with 2565 on a 1237 second block. Swedish contender, Helen Johnsson and Rebeca Veloz of Mexico (tie), Lynda Barnes of USA, Ghislaine van der Tol of the Netherlands and Melody Young of Hong Kong finished in the top 10 with less than 40 pins separating them. A new high game of the tournament for the women were shot by both Sandra Torrents of Spain and Sharon Koh of Malaysia with 268. Sandra has played in five previous Bowling World Cups, including 2005 in Ljubljana and last year in Caracas. With qualifying at the halfway stage, the cut is currently a 195 average with Irena Strakova of the Czech Republic in 24th place. 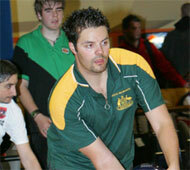 5th November, St. Petersburg: First block leader, Jason Belmonte of Australia maintained his lead after the completion of the Men's second block of 6 games in the 43rd QubicaAMF Bowling World Cup with Bill Hoffman of the United States hot on his heels in second. Belmonte up his double-handed pace to reel off 249, 255, 245, 213, 190 and 222 for a superb 1374 in the second block giving the Aussie a 12-game total of 2826 for the lead. 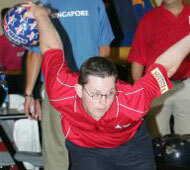 Bill Hoffman of USA, who was only 19 pins adrift in the first block, trailed Belmonte by 26 pins with 2800. Finland's Petteri Salonen posted the highest 6-game series of the world cup with a scintillating 1538 to top the second block and managed to haul himself up from 48th to third on a total of 2696. Perfect gamer, Ildemaro Ruiz of Venezuela kept pace with the leaders to finish fourth with 2685. Glen-Morten Pedersen of Norway, Andres Gomez of Colombia and Peter Ljung of Sweden finished fifth to seventh with 2650, 2648 and 2621 respectively while first block Squad A leader, Paulo Lopes dropped to eighth with 2591. Israel's Yahav Rabin and Thomas Gross of Austria rounded up the top 10 with 2589 and 1580. The cut for the top 24 will take place after 24 games have been bowled by all the competitors. 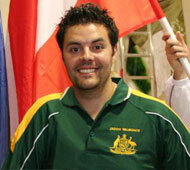 At present the cut is a 207.92 average for the men held by 2005 champion, Micahel Schmidt of Canada. The women will take to the lanes for their second block later today. Photos by courtesy of Hero Noda and QubicaAMF. 4th November, St. Petersburg: World Cup debutant, Sun Hee Lee of Korea blitzed the lanes at the Kontinent Bowling Center to take the lead in the Women's first block qualifying round of the 43rd QubicaAMF Bowling World Cup on Sunday evening. Sun, 36 from the town of Dan Jin Kum and had looked in fine form during the practice session, posted consistent lines of 236, 244, 236, 221, 223 and 226 for an impressive 1386 to lead a field of 73 top women bowlers from the world. 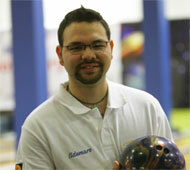 Aumi Guerra of Dominican Republic finished second with a total of 1376, just 10 pins adrift the leader, Sun. Guerra had only arrived St. Petersburg a day before Hurricane Noel hit her home country. 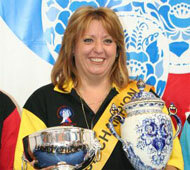 Squad A leader and a season campaigner of the Bowling World Cup, Sue Abela of Malta, settled for third spot with 1342. Abela had featured 9 times in the series after an amazing 20 years since debuting in Malaysia. Sweden's strong contender, Helen Johnson kept pace with the leaders throughout to finish fourth with 1336. This is her fourth appearance in the Bowling World Cup and will be looking to improve on her two fifths and a sixth placing in Singapore, Ljubljana and Caracas. 2005 champion, Lynda Barnes started off slowly but gradually hauled herself up to a creditable 11th with 1252. The high game in the women’s section of the tournament so far is 263 from Tina Hulsch of Germany. The cut for the top 24 will take place after 24 games have been bowled by all the competitors. At present the cut is a 195.8 average for the women. 3rd November, St. Petersburg: World Tenpin Masters champion, Jason Belmonte of Australia set a blistering pace in the opening block of the 43rd QubicaAMF Bowling World Cup at Kontinent Bowling Center to claim pole position. The unorthodox two-handed Jason started the second squad of the 6-game frist block with 275 followed by a 244 and 200 for 719 series with Bill Hoffman of the United States hot on his heels with 711. But the 24-year-old Aussie stretched his lead by 49 pins after a superb 286 in his fifth game and ended the block with 224 for a total of 1452. Hoffman narrowed the gap with a superb 254 in the final game to trail by just 19 pins on 1433. The top 2 were the only bowlers to surpass the 1,400-mark in this 6-game first block. Venezuela's Ildemaro Ruiz did well to take third spot with 1393, 8 pins ahead of Squad A surprised leader, Paulo Lopes fourth with 1385. Ruiz also became the first bowler to record a perfect game in this world cup in his fifth game. Russia's Alexey Parshukov rounded up the top 5 with 1378. Strong contenders, Andres Gomez of Colombia kept in touch with the leaders to take up sixth position with 1365 followed by 1998 champion, Mohammad Khalifa Al-Qubaisi of UAE seventh with 1349. 2002 runner-up Remy Ong of Singapore, who finished third in the earlier squad took eighth with 1333. Israel's Yahav Rabin finished ninth with 1316 while Scotland's Mark McQueen and Austria's Thomas Gross tied in tenth with 1315. 2005 champion, Michael Schmidt of Canada struggled in this block ending up in a lowly 27th. The men will continue with the second block of 6 games tomorrow while the women will take to the lanes shortly.